Circa 1935, The outward design glass shades are original must be seen to be really appreciated. It’s what is behind the shade that drove our UL lighting shop back to the drawing board. 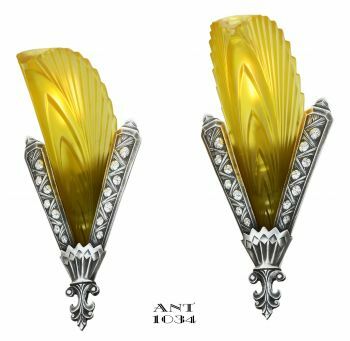 These French sconces turned out to be a work of electrical re-design with the newest state of the art LED technology to give us the results we wanted. 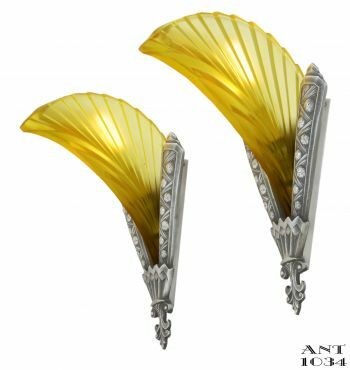 Because these truly are French antique shades, the lighting used for such a large shade, that reaches out from the wall to give a 3-D lighting affect, was truly, and originally, badly designed. It gave a minimum impact for a shade of this size ...and of course...used an insignificant bulb. We removed the dinky French bulb and socket and installed a standard chandelier based American socket and used our long tube LED bulb to give these lovely sconces the “punch” of light that we judged to be pleasing. We will give you this LED bulb, with the sconces, and it can be re-ordered. (E12-5W27)....and yes...it does have a pleasant incandescent color rather than those nasty bright-white-bluish colors. So many elements working together for a fantastic result. Metal....White cast metal. The finish is pewterized with dark accents...like oxidation. Glass...Amber finished, VERY minor roughness commensurate with age and use. Measurements: 14” tall by 7” wide and protrudes a neat 9” for effect. 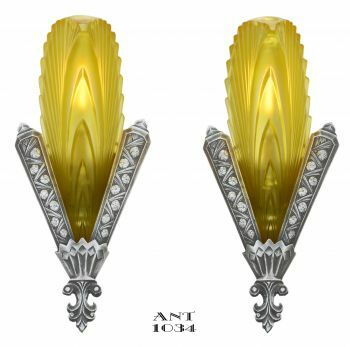 Price: $ 1,250.00 for a very nice complete & UL re-wired pair of French sconces in great condition. Our wonderful E12-5W27 bulbs are included.... plus careful shipping.